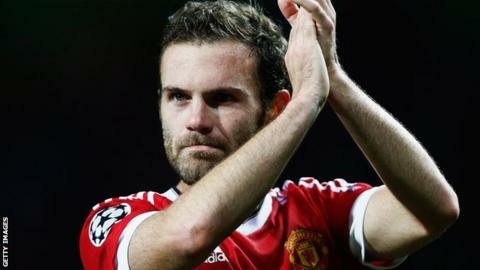 Midfielder Juan Mata has insisted Manchester United will recover from their poor run of form, which has seen them go five games without a win. United's 3-2 defeat by Wolfsburg last Tuesday knocked them out of the Champions League, and they lost 2-1 at Bournemouth in the league on Saturday. In his weekly blog, the 27-year-old wrote: "In these moments is when we have to stick together more than ever. "Everything passes and this bad streak will pass." United, who are fourth in the Premier League with two wins from their past seven games, host Norwich on Saturday before travelling to Stoke on Boxing Day, then return to Old Trafford to face Chelsea on 28 December. Spain international Mata continued: "We are aware that we have to get better and that's why, despite feeling so bad after a painful defeat, we have to stand up and keep working to prepare the next game. "With the right attitude and each of us giving the maximum we will get out of this situation. "This is a long season and there's still a long way to go. We will never give up, that's for sure."